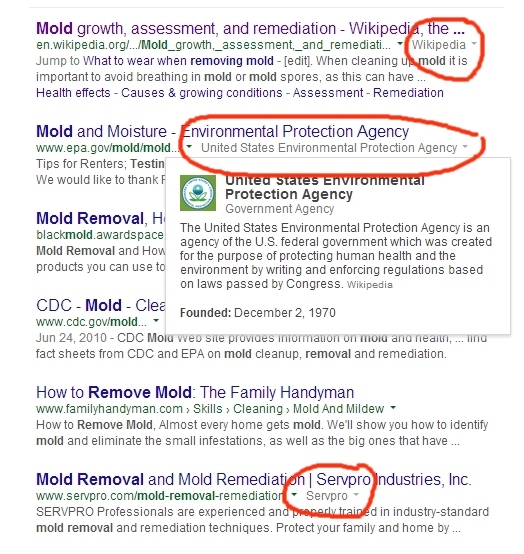 Google is now showing a little pulldown to the right of the website URL in their search results. When you click the pulldown, you get a synopsis of the company or organization. In the admittedly limited testing I’ve done so far, I’ve only seen info on the company pulled from two sources: Wikipedia, and DMOZ. Wikipedia is an understandable source, as Google has structured access to that information via their Freebase service. DMOZ is a different story, however, as it’s been notoriously difficult to get added to, and hence its information can be pretty thin and out of date. I did check one of the examples where the company info was pulled from DMOZ, and that same company is in Freebase as well. Regardless, I’d call this a mildly interesting new user experience feature.